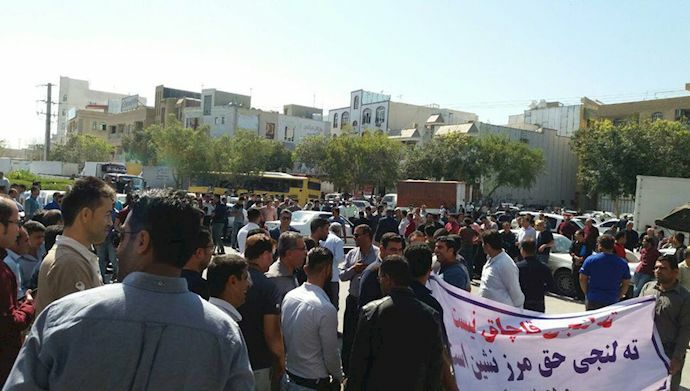 Plundered clients of Caspian and Arman-e Vahdat fraudulent financial institutes, men and women, staged protests on Sunday, April 15, 2018, outside the companies’ branches in Ahwaz, capital of the southwestern Iranian province of Khuzistan. The protesting women also carried a large banner reflecting the same idea. On the same day, women plundered by Arman-e Vahdat Institute gathered outside the company’s Shariati branch in Ahwaz and staged a protest. Protesters also locked up the entrance to the company’s branch called Melal, and covered with mud the door of another branch called Zeiytoon.